Locate electronic books owned by Reed Library. When searching the catalog, limit by collection to Electronic Books or Ebrary Ebooks. Ebrary contains thousands of ebooks across multiple disciplines - including music. Click on the link above to access the complete list of music books in Ebrary, and browse by keyword or topic. 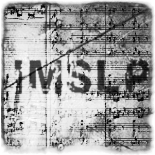 A community-built library of public domain sheet music. Extensive collection of original scores scanned to PDF. One of the best online resources for finding free public domain sheet music on the Web. A wiki-style repository of free choral/vocal scores, texts, translations, and other useful information. Classical sheet music, based on editions in the public domain, available for for free download. A source for public domain sheet music, available in Finale or XML formats for download. Need a book or score that Reed Library doesn't have? Get it through Interlibrary Loan.